Found in all the season, papaya is a delicious fruit which is remarkably known as the “fruit of the angels”. 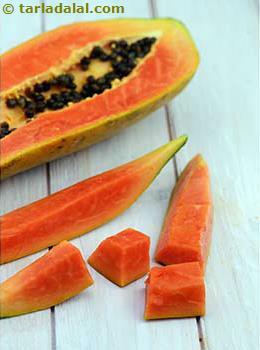 Ripe papaya is also very commonly used as an addition to make chutney, salads, etc. Papaya contains a special enzyme called as papain which is a very powerful digestive aid, helps in detoxifying the body. Even if the glycemic index of papaya is medium (60), it has huge potential benefits which makes it super healthy to consume. This is because the glycemic load of papaya is only 6.4 for 1 cup of papaya (150 grams) which falls under low glycemic load range fruit. Is papaya safe for diabetics? The question is even if the glycemic index of papaya comes under medium range how this fruit is beneficial for diabetics? This is because the glycemic load of the fruit is just 6.4 for 1 cup of papaya. It is very important to understand the distribution of carbohydrates throughout the day so that your blood sugar doesn’t fluctuate. It is fairly a good source of potassium that will control your blood pressure. It is also a good source of beta carotene which improves your vision. Is papaya suitable for weight loss? Fruits and vegetables is an important part of a diet when you want to lose few kgs. As 1 cup of papaya is estimated to provide around 50 calories, it is a much better choice over fried snacks. Incorporating papaya in your diet will give you a feeling of fullness since it has good amount of fiber (1.6 grams in 1 cup of papaya). Thus proven to be a good choice for weight watchers.